The Classics Section teaches Greek and Latin, and courses in translation about the ancient Greeks and Romans. We offer a major (specialization) in Classics, and minors in Classical Civilization, Latin, and Greek. Contributing faculty from other departments on campus also teach a range of courses on the classical world. Our interdisciplinary major and minors are particularly flexible, allowing students to pursue Classics in addition to their other interests. Check out this nifty chart to see how close you may be to a Classics major or minor after just a few relevant courses. For info on what our student group is up to, check out their Facebook page. For further information about Classics at SIU, do please contact the Classics Section Head and Advisor, Dr. David Johnson at mjohnson@siu.edu. 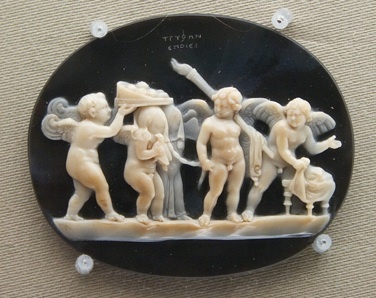 A 1st century BC Cameo of Cupid and Psyche from the Boston Museum of Fine Arts. The inscription reads “Tryphon Made (Me)”.